I couldn’t let it go. 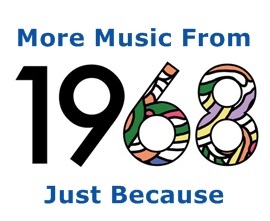 There was so much great music from 1968 that I had to come back with another 10 songs … and I could have made it 20 or 30 more. By the way, Frank was right. Once again! Big SIGH!!!! Thanks for starting my day in an awesome way~! You do know how to accomplish that! Yes Frank was right – and we still haven’t gotten it… thanks for keeping 1968 alive — it was such a good year with so many great memories ….